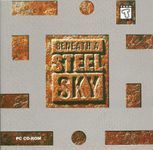 "Beneath a Steel Sky is a British 1994 science-fiction point-and-click adventure game in the cyberpunk genre. It features comedy elements and was developed by Revolution Software and published by Virgin Interactive Entertainment. It was initially released for DOS and Amiga. Its working title was Underworld. The game takes place at an unknown point in a dystopian future in Australia, where the Earth has been significantly damaged by pollution or nuclear fallout. The game's backstory is introduced via a comic book, drawn by well-known comic artist Dave Gibbons, that tells the story of a young boy called Robert who is the sole survivor of a plane crash in "the Gap" (the name applied to the Australian Outback at the time of the game). Too young to fend for himself, Robert is adopted by a local group of Indigenous Australians, who teach him the skills he needs to survive in this harsh new environment; they name him Robert Foster, partly due to him being fostered by them and also because of the discovery of an empty can of Foster's Lager, an Australian beer, found near him at the crash site. Foster even learns engineering and technology and builds a talking, sentient robot called Joey. After Foster has reached adulthood, he is kidnapped and his tribe annihilated by storm-troopers sent from Union City by its all-powerful computer LINC. Interestingly, Union City mentions prominent suburbs and train stations found within Australia's largest city, Sydney, leading some to speculate that Union City was once Sydney. This was confirmed in a 2005 interview with the Australian gaming magazine, PC PowerPlay. Foster manages to escape from his captors as the helicopter transporting him back to Union City crashes just after entering the dome, leaving him and his robot friend, Joey, to find out why they were brought there and where to go next, while security continues to search for him. Joey's personality is stored on a small circuit board, which can easily be inserted and removed from many types of robot bodies. This allows Joey to change bodies as the situation requires, provided his circuit board is not damaged. Joey, however, is not always happy about Foster's choice of body for him." Source: Wikipedia, "Beneath_a_Steel_Sky," available under the CC-BY-SA License.